Upload firmware upgrade bundles to Fabric Interconnects. 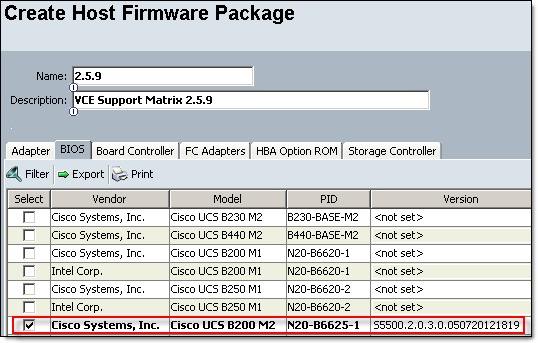 If you have two Fabric Interconnects configured as a cluster, the firmware upgrade bundles will be uploaded to both FIs. It does not matter which FI, primary or subordinate, you are connected to. Even if one FI is down, you still can upload firmware upgrades to the active FI. Software and configuration will be re-synced when FI comes back online. Some of these steps take long time to complete. Please don’t panic, let UCS Manager do its job!!! Update Adapters, CIMC and I/O Modules. When you update firmware is just loads new version to Backup Version slot. The new version will be activated when you restart components. Click Update Firmware, Select Adapters from the Filter: drop-down menu, Select (o) Bundle, Set Bundle to the version you want to upgrade to and click OK.
Click Update Firmware, Select CIMC Controller from the Filter: drop-down menu, Select (o) Bundle, Set Bundle to the version you want to upgrade to and click OK.
Click Update Firmware, Select IO Modules from the Filter: drop-down menu, Select (o) Bundle, Set Bundle to the version you want to upgrade to and click OK.
Click Activate Firmware, Select Adapters from the Filter: drop-down menu, Select (o) Bundle, Set Bundle to the version you want to upgrade to and click OK.
Click Activate Firmware, Select CIMC Controller from the Filter: drop-down menu, Select (o) Bundle, Set Bundle to the version you want to upgrade to and click OK.
CIMC firmware will be upgraded, CIMC controllers restarted, all active CIMC sessions will be disconnected. Click Activate Firmware, Select UCS Manager from the Filter: drop-down menu, Select (o) Bundle, Set Bundle to the version you want to upgrade to, select ICC and click OK. Confirm to ignore compatibility check. You will loose connection to UCS Manager. Please log back in. Activate subordinate fabric interconnect — Choose Ignore Compatibility Check when performing this step. All I/O Modules in the data path of this Fabric Interconnect will be restarted and firmware upgraded (see step 6). You need to make sure your blades are configured for data path redundancy, otherwise you will experience downtime on blades. Activate primary fabric interconnect — Choose Ignore Compatibility Check when performing this step. I like to keep Fabric Interconnect A as Primary. Update host firmware package(s) for servers — Must be the last firmware upgraded. Host firmware package will include firmware upgrade for BIOS, Storage Controller and Adapters. You can amend existing Host Firmware Package to include new firmware versions or create a new one. 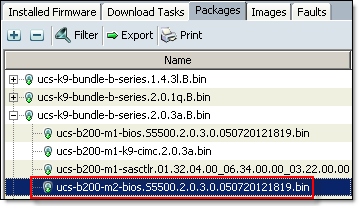 New Host firmware package will need to be associated with the Server Service Profile(s). Before you amend Host Profile Package to include new firmware or associate a new Host Profile Package with a Service Profile, make sure you check and understand how these changes will affect physical servers. Make sure you have management policy setup correctly. Open Servers tab, Policies node, Maintenance Policies. User Ack – User will need to acknowledge server reboot in Pending Activities. The interesting part is that even if user reboots the server manually, the changes will not be activated, you need to acknowledge the changes in Pending Activities. Assign newly created Host Profile Package to a Service Profile: Navigate to Servers tab, Service Profiles, select Service Profile assigned to server(s) you would like to upgrade. In the Work pane click on Policies tab and expand Firmware Policies, select Host Profile Package and click Save Changes. Depending on the Maintenance Policy configured, the server will be rebooted immediately or you will need to acknowledge reboot when you ready. Navigate to Admin tab, All node, Communication Management, Call Home. In the work pane change State to On, click on Save Changes. This info. was beautiful and well explained. Thanks a lot. This is really really a nice url and well drafted. Great guide, thanks. Whats the difference between selecting Bundle over Version as I’ve always selected Version in the past and its updated as expected? There is no difference, you can use either. Mark thanks for sharing this HOW TO! It is well explained and it has been very helpful for me. Thanks you for sharing the detailed step by step guide for UCS firmware update. Really helpful. really nice guide thanks ! In my setup, FI A has updated firmware (latest version activated than FI-B) and FI B has older Firmware activated (But latest firmware is already upload in its flash/storage). If I configure & activate FI-B firmware equal to FI-A, will this process reboot FI-B ?